My next project is to build a classic aircraft fighter from WWII, a Corsair, a Zero or something like a Messerschmitt. I owned nothing for rotor blades so I bought a 42020 for 9€. 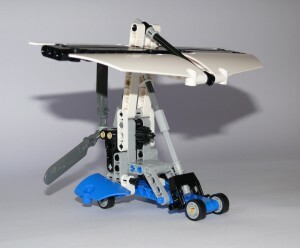 This cute little helicopter has 2 tree blades rotors, which is enough for any kind of plane i could build later ! Once in hands, and built, I realized that i could try to transform it into a small MoC and the more interesting idea which popped in my mind was a microlight. 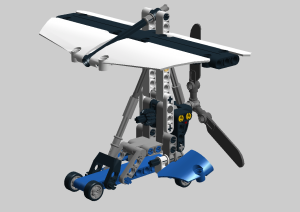 So, here it is, it’s a kinda small moc, and for the wings, i’ve had to add a few more extra pieces, taken from the 42039 race car. It’s not perfect, mainly because i’m unable to create perfect things, my son taken appart, and also because I tried to use only what was available in the 42020 set. The rotor is clearly too big, or the microlight too small, question of point of view.